For more pictures of Ran Hwang's work, click on the link above to Traditional Home. In the hands of Ran Hwang, buttons and straight pins turn into works of art. 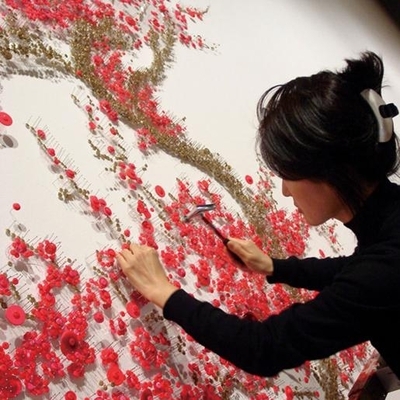 She painstakingly pounds tens of thousands—even a million—of them into panels to create plum blossoms, phoenixes, the Buddha, Korean rooftops, and other exquisite wall compositions and multimedia installations that are coveted by collectors like Roger Federer, the Brooklyn Museum, and Robert J. Hurst, chairman of the Whitney Museum's executive committee. Sometimes, she fixes the buttons tight against the surface; often, she leaves space for the buttons to move freely. 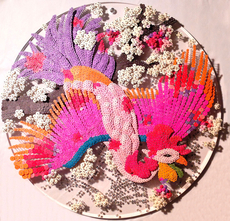 She may also use colored thread or beads or colored paper characters in her designs. For a commission at the ultra-modern, dhow-shaped Dubai Opera House, which opened in August 2016, she made a shimmering chandelier with a spider-web design that includes more than 50,000 crystals. It extends more than 50 square feet. Like fresh flowers or French bonbons, Hwang's works are hard to resist. "Her work is so beautiful and so well-crafted," says Laura Thompson, the director of education and a curator at the Massachusetts Museum of Contemporary Art, which has twice shown Hwang's work. 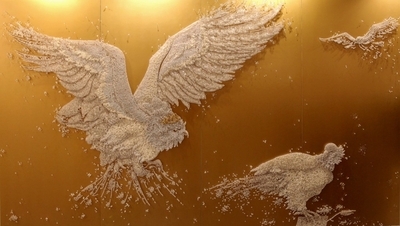 Untethered, the more recent piece, is a 140-foot-long sculpture of buttons and pins featuring 14 birds, including six phoenixes, interwoven with metallic spider webs. Arnold Lehman, former director of the Brooklyn Museum, first took notice of one of her "cherry tree" pieces at Leila Heller Gallery in Manhattan, partly because it required so much dedication. 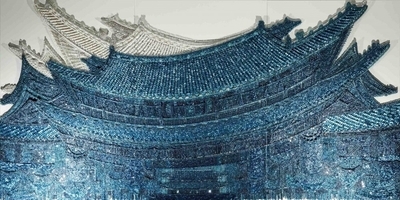 "I was even more taken by an amazing re-creation of traditional-style Korean roofs in what seemed a somewhat more abstracted work," he says. It's now in the museum's collection. But there is more to her work than visual appeal. "It also has a powerful, simple message, about hopefulness and about freedom and the limitations of freedom," Thompson says. Oddly enough, it was 9/11 that brought out Hwang's true talent. Born in Busan, South Korea, she started out there as a painter of landscapes and still lifes. In 1997, she moved to New York intent on developing her own style, but after studying at the School of Visual Arts, she took a job designing embroidery in the fashion industry—a throwback to her childhood habit of making hats, shoes, and clothing for paper dolls. Deeply affected by the terrorist attacks, she yearned to have a greater impact. She left fashion to make art that would impart meaning about ephemerality and eternity as well as convey a sense of spirituality. "I grew up in a Buddhist family," she explained one day last summer in her New York studio. Looking chic in black pants and top, with a red plastic flower bracelet on her arm and a matching red dome ring on her finger, she said, "I mix fashion images and Buddhist philosophy. Eastern style and Western style come together, and I make something new." And whereas all that pounding—usually about 25 times per pin—in the assembly of her pieces might seem tedious, for Hwang it has a Zen meditative quality that is integral to her practice. These days, Hwang is so busy that she employs assistants to help with the pounding, and she divides her time between studios in Seoul and New York. "I get my ideas here," she says. "Seoul is like a factory." Those ideas keep taking her in new directions. She started with vintage buttons, then began buying buttons to her taste from manufacturers, and now frequently orders handmade paper buttons. She has incorporated LED lights or video projections on some installations, changing their colors and giving them more vitality. Lately, she has started working on more traditional, three-dimensional sculptural forms, though not departing far from her subject matter. Last summer, she was working on a mold for a bird's wing. It was too soon to tell how the wing would ultimately turn out, but there's little doubt that it would soar aesthetically.